Download Norton Removal / Uninstall Tool. How to Remove Norton? Do you facing issues with Norton software in install, uninstall or license activation. Then Norton remove and reinstall tool can help you. As security software install deeply in the system to give maximum protection, so uninstalling them from the control panel or add / remove program alone leaves some entries behind. To remove all these entries use the removal tool provided by the Norton. Below is a brief guide to use the NRnR utility. How to remove / uninstall Norton? Follow below steps to remove or uninstall Norton Security completely. 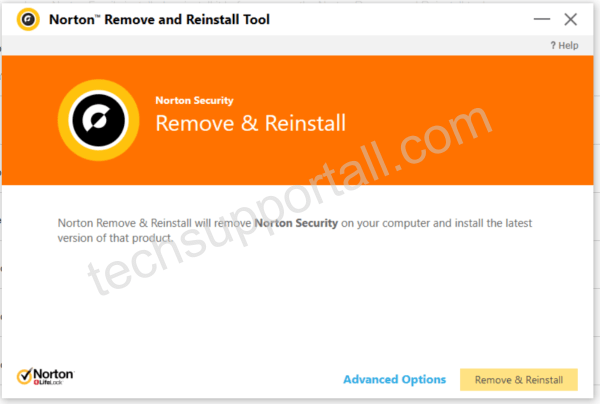 Download Norton remove and reinstall tool from its official website. Run the downloaded file. Click Agree. Install the tool and if windows ask, Click on ‘Install anyway’ or ‘Yes’. After that read the license and click on Agree button. Now select if you want to reinstall the Norton after removal or Just want to remove. For ‘remove only‘ option click on the advanced option. Click on remove button and restart the system to complete the removal process. Why should use ‘Norton removal tool’ instead of uninstalling it from ‘Add / remove programs’? If you uninstall Norton without proper uninstaller or removal tool it can cause issues like freezing, or getting installation or activation errors etc. This method should work for all Windows versions like Windows XP, Windows 7, Windows Vista, Windows 8 and Windows 10. It would be helpful for the other users if you provide the reason to remove Norton from the computer. Please write in the comment box that why do you uninstalling the Norton security? If you are still facing issue in uninstalling a third party uninstaller software can also help you. Download Revo uninstaller.